In addition to my chipboard ATC base I've added a bird from the whimsical bird set 2, mini stencils distressed diamond and numbers were also used on the base. 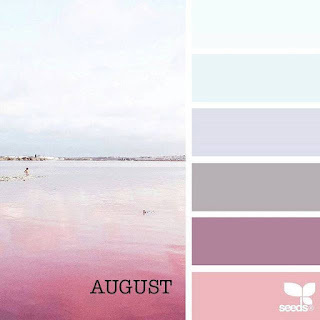 Hello my dear crafty friends and welcome to our Use mists Tando week! This small project was made over Tando Mixed Media board with other Tando products (shown later) and only MISTS! I used a mix of copper and dark orange mists over the chipboard pieces that were previously covered with a thin layer of white gesso. The first layer was masked with texture paste background. Then Industrial wing was added on it. I am not sure that you can see the intermediate layer made with Tando Book plate under two more layers. The last chipboard layer is very old Tando Dragonfly(not in the shop anymore, sorry) and then metal and resin pieces were added. I added some more texture with micro beads and made the sentiment with epoxy sticker. 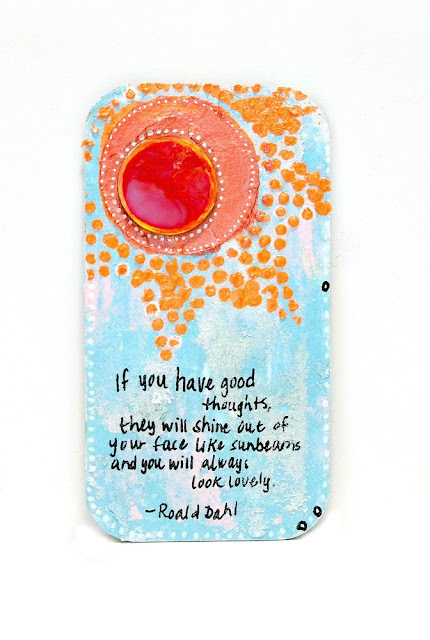 Here is a quick and simple card for you using the DecoArt Media Acrylic Sprays. Spray the Primary Magenta through Giovanna's Doilie mask over a sheet of thin white card. Add splashes of Orange and Primary Yellow. Cut a section to go on a card. 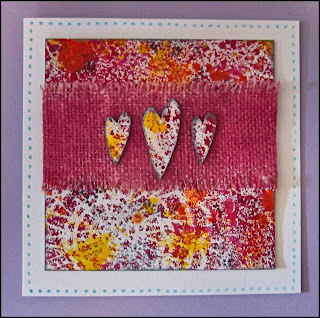 Spray some Burlap with Primary Magenta and glue it over the patterned card, tucking it around the sides. 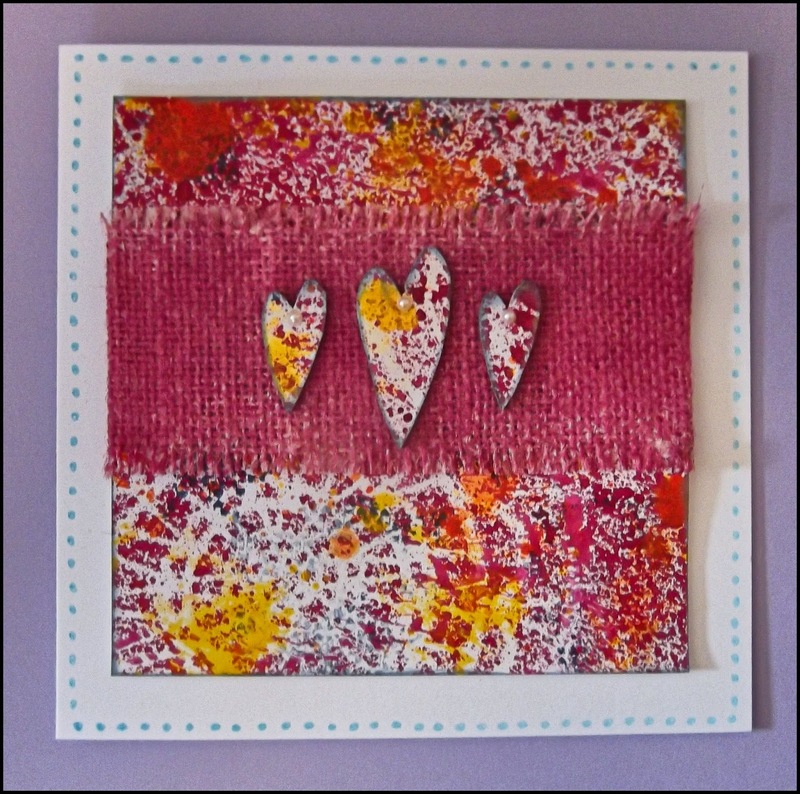 Attach scraps of the patterned card to 3 hearts from the Hearts mini's , cut out and glue to the burlap as shown. Hi! 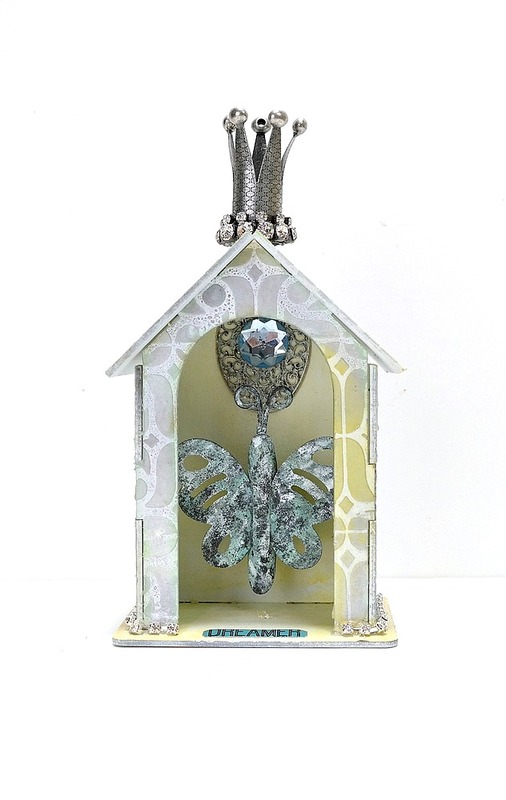 Dana here today sharing the Shrine I altered for the Spray Ink theme this week. I started this project by priming both sides of all the pieces of the shrine with a white spray primer. Next, I spread DecoArt White Modelling Paste over the stencil from the Nathalie Kalbach Fashion Dame Rubber Stamp Set onto the outer sides and roof of the shrine. Once the paste was dry, I sprayed the same pieces with a silver mist. Finally, I inked the edges with several colors of chalk ink and assembled walls of the shrine, holding the pieces together with hot glue. Next, I spritzed the inside of the shrine with yellow mist. I used hot glue to attach a weathered metal butterfly, ornate metal oval, and blue gemstone to the back wall of the shrine. I added some silver rhinestone trim and a sticker to the base of the shrine. I finished this piece by gluing on the roof pieces and topping it with a metal crown. You can find the products I used for this project in the Tando Creative Retail Store. We'd love to see your creativity! Share your work with us in Tando's Creative Zone on Facebook. Hi! 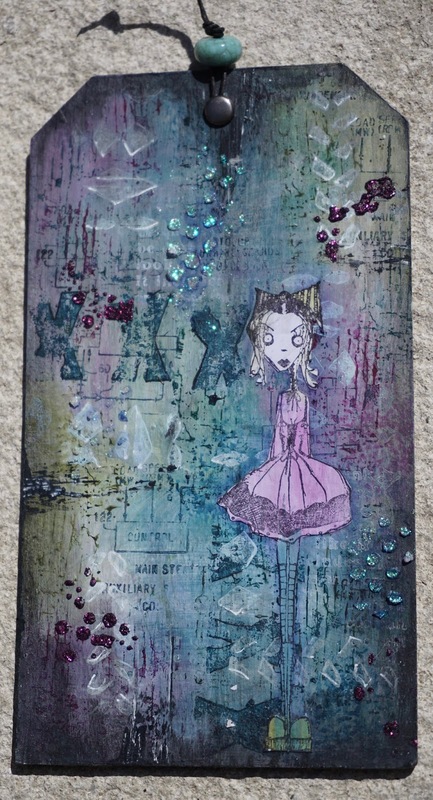 Dana here toady sharing the Mixed Media Board I altered for the Anything Goes theme this week. I primed my board with DecoArt White Gesso. Once that was dry, I used a spatula to spread on blue, silver, and pink paint that was very close to being dried up completely. This old paint was a fun way to not let my supplies go to waste and also create some cool texture at the same time! Next, I spread more chunky paint over the Kaz Boughton Dotted Star Mask. I topped the sun with a chipboard circle from the Andy Skinner Industrial Elements Set that I colored with liquid inks. I finished this board with some black and white doodles and a hand-written quote. Hi everyone Dee here today with my post for the week. & Phthalo Turquoise fluid acrylics. I also used Titanium White to stamp onto the tag. 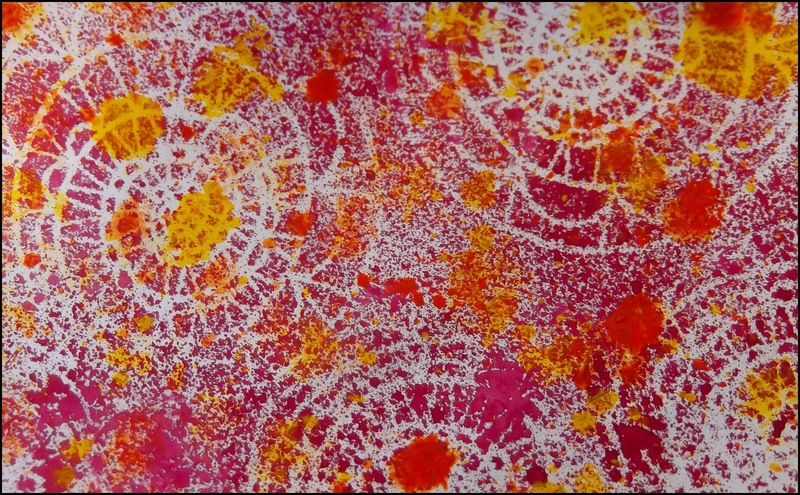 I painted the stamponique image with a watery wash of the above colours. Tando Creative size 10 grey board tags, Stencils Ink Splatters Mask & Sequin Waste Mask. Deco Art media acrylic paint Titanium White, Dioxazine Purple, Sap Green & Phthalo Turquoise. Stampendous Andy's STEAMPUNK, Industrial sets & Stampendous marks sets. From my stash glitter paste and Stamponique stamp. Hi, Carol with you this Wednesday with my free for all post. Lightly dry brush some Quinacridone Gold over the Kraft Card and when that is dry do the same with Cobalt Turquoise and a little Primary Magenta. When dry overstamp with Nathalie Kalbach's MARKS stamp in Archival Black. Dab some white acrylic through the Mini Mask Numbers as shown. Stamp the eye from Andy Skinners Curiosity stamp set using Archival black and colour in (I used the same colours as before but watered down) Cut out and attach to the centre of the base using a sticky pad. Dry brush some white acrylic around the outside. Attach the panel to a white card base. Hello my dear crafty friends and welcome to new Anything goes post. Today I am going to share my new chipboard mini book cover made with bare Tando chipboards and Mixed Media DecoArt products. First I need to say that the background mask is not really a mask but a die I used for the texture paste as I wanted something small and didn't find the small Tando mask in my pretty large stash.So I used the very old metal die and added the DecoArt texture paste over it. Then I painted the inside and outside of the book cover with a mix of Media line paint and added the small book plate over the cover. Fun metals and flowers cluster was added for the interest to the cover. Here are some close- ups to the painted , stencilled and painted cover. I decided to stay in grey- blue and purples and to make it vintage dark in just three colors. Metal pieces, small chipboard plate, fabric and paper flowers were also painted into the matching colors. Mixed Media Boards with Lisa. Hi folks and welcome to this weeks post for Tando Creative. This week the theme was mixed media boards. 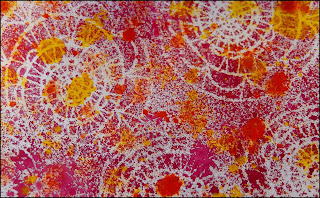 Tando Mixed Media Boards are fabulous small boards which can take loads of layers of different products. They are fabulous for having a play with and trying new techniques with. I used three of the 74mm x 138mm mixed media boards for this project. First, I gave the boards with a coat of DecoArt white gesso then painted them with DecoArt Media Acrylic Paints. 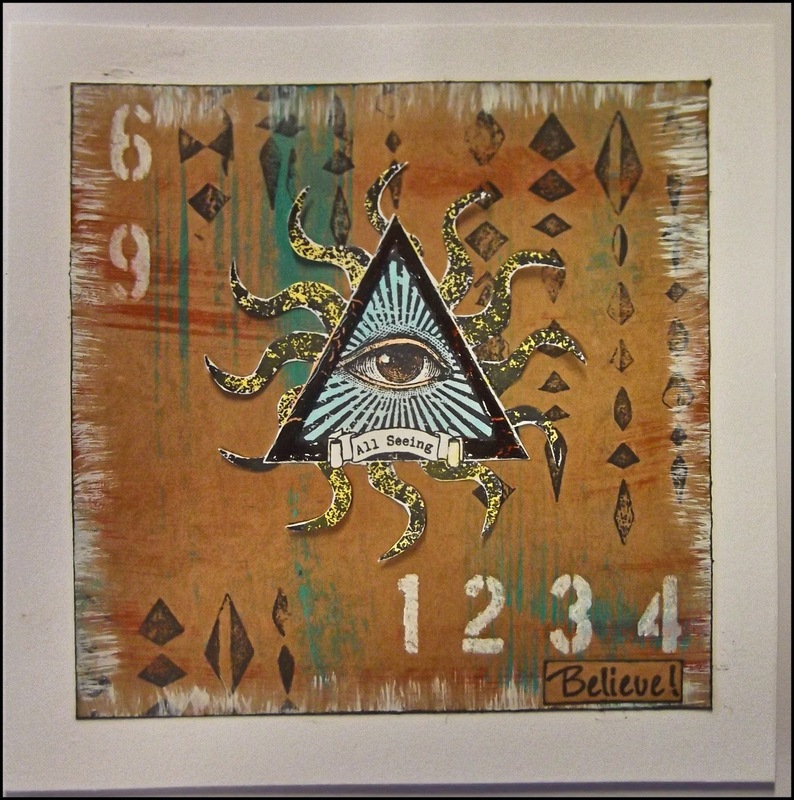 I then used the Tando 4 x 4 clock mini mask with DecoArt white modelling paste on the background. I added DecoArt Crackle Paint randomly over areas of the boards to add some texture. 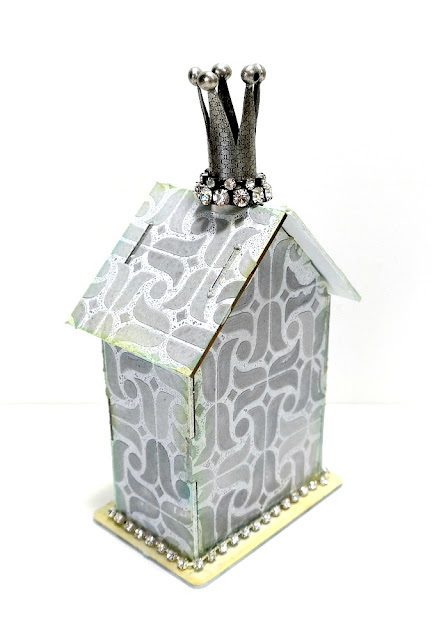 I used the Tando 6 x 6 sequin waste stencil with the DecoArt paints. 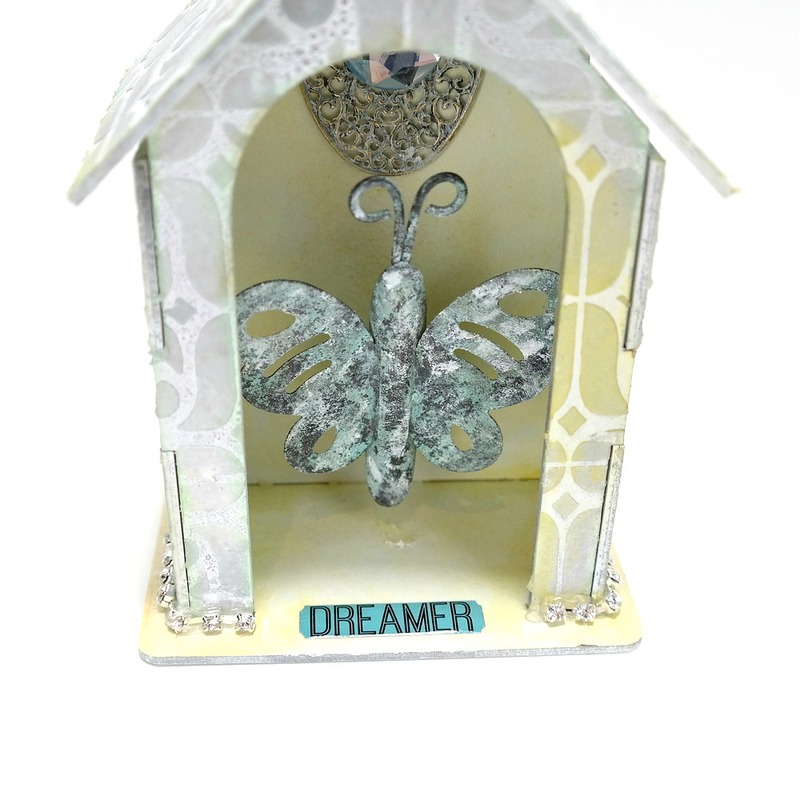 I added more layers using a chevron stamp and a Mini Textured Checkerboard stamp. I used Stampendous Frantage Embossing Enamel in Shabby Green on Tando holly flourish. I also used the Frantage on some paper flowers and added some white natural raffia. I also recycled some onion netting packaging which I painted to make it darker and added some glue to some areas and adhered microbeads. I used a selection of stamps which I stamped on to acetate with black Stazon Ink. I cut the acetate wider than the mixed media boards and adhered each side of the acetate to the back of the board to create a bubble over the front of each board. I really like this project of mixed media boards. They are so versatile to use and just the right size to create fabulous mini projects. I have two Mixed Media boards to share with you today as seen on TV! 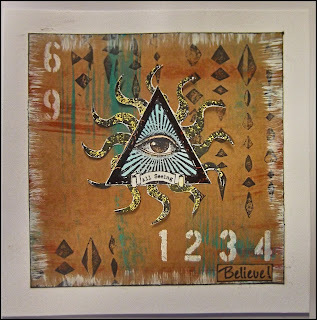 The background was created using a [Mixed Media Board] 74mm x 138mm DecoArt [Fluid Acrylics], rubber stamps and the [Clock Mask], these boards are just the right thickness so they don't buckle when heated up or wet! These Mixed Media boards were so much fun to make! 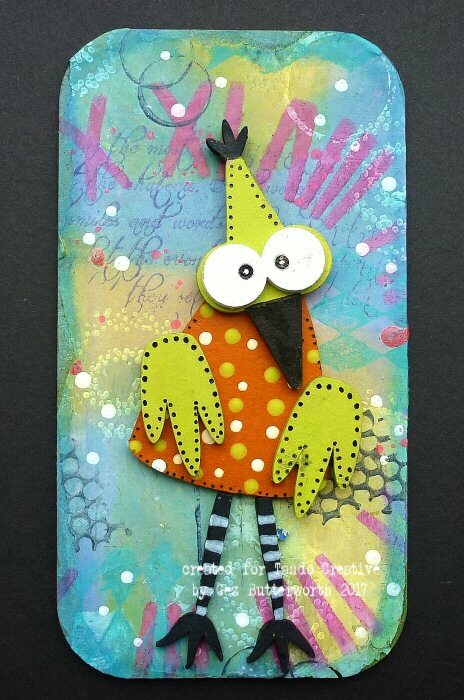 The mixed media boards come in a set of five and each set of Whimsical birds come in a set of six. So lots to play with! 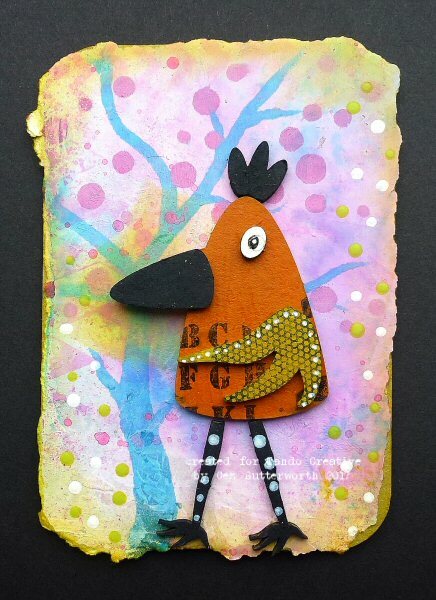 Here are a few more samples using [Tags] as well as mixed media boards for backgrounds and lots of Whimsical birds!